This wiki is about Tay- Sachs Disease (TSD). It explains the diagnosis, treatment, prevention, and current research possible for the disease. To obtain a basic understanding about the Tay-Sachs disease. To understand the importance of diagnosis, prognosis, treatment, and prevention. To understand the current research into different types of possible therapy treatment for the disease. This wiki is about our class project in Genetic. After you read this site, you will gain understanding about Tay-Sachs disease, research and therapies. What is Tay-Sachs Dissease (TSD)? According to the National Institute of Neurological Disorders and Stroke (NINDS) "Tay-sachs disease (TSD) is a fatal genetic lipid storage disorder in which harmful quantities of a fatty substance called ganglioside GM2, build up in tissues and nerve cells in the brain." NINDS said that it is an autosomal recessive genetic disorder and a very rare disease because it strikes small children and babies. In the first few months of their life infants seen to be normal, but the symptoms appear when the nerve cells become swollen with the ganglioside GM2. Mental and physical abilities severly deteriorate. The signs, includes deafness, blindness, and difficulties in swallowing the food. Tay-Sachs Disease is caused by a genetic mutation on the HEX A genome on chromosome 15 as researchers demonstrated in the late 20th century, from "News medical" web site. 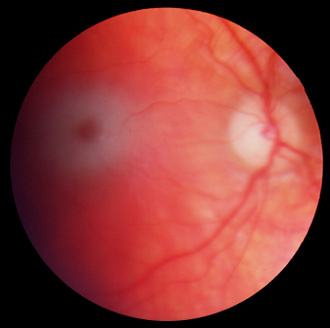 Dr. Warren Tay (1843-1927) was the first ophthalmologist who reported the symptoms of Tay-Sachs disease and he reported that cherry red spot in the eye is the sign of Tay-Sachs disease. Dr. Bernard Sachs (1855-1944), a Neurologist from New York who reported the observance mostly babies in Eastern European Jewry. The most severe form of Tay-Sachs Diseae begin to affect babies when they are only a few months old. Initially, they begin to loose their eye sights and react abnormally, and their development is delayed. This form is common for children who are older than 6 month. A child with a severe case my become blind. The symptom will show in children between 2 and 5 years of age due to the lackof Hexosaminidase-A (Hex-A) enzyme. This is an unusual form of TSD. Children with this form are usually older, and they are totally lack the enzyme Hexosaminidase A (HEX- A). Potential parents check for the possibility of carrying the mutation. The fetus is checked for two copies of the HEX A mutation which have been inherited that will cause Tay-Sachs disease. Potential couples consider the risk and possibility for having the disease. To determine if the fetus has been inherited the mutation from both parents. A blood test is common for testing the disease because it quickly determines the results. The doctors uses the Ophthalmoscope to diagnose to detect red eye spot in patients. Microscopic analysis of neuron is also used to see if there is an additional build up of Ganglioside. Anticonvulsant medicines are used to control the seizure. Appropriate nutrition is necessary for the suffering children. Tay Sachs Disease patients usually die at age 4 due to the infections. The chances of longer survival are uncertain. Few patients will live only until the age of 12 or 13 years old, but most will not live in adulthood. The prevention of the TSD can only be done by carrier testing and prenatal testing in order to check the existence of any copies of a mutated gene. Also, these tests are used for couples who are in a high-risk population such as Ashkenazi Jews. Tay-Sachs Disease is caused by a genetic defect in a single gene with one copy of that gene inherited from both parents. It is an autosomal recessive disease according to News Medical web site. This mutation in the HEXA gene on chromosome 15 causes Tay-Sachs Disease. The HEXA gene plays a critical role in the brain and spinal cord and provides instructions for making part of an enzyme, beta-hexosaminidase A. This enzyme is located in lysosomes. In cell lysosomes break down toxic substances and act as recycling centers. Within lysosomes, beta-hexosaminidase A helps break down a fatty substance called GM2 ganglioside. As a result, the accumulation of this substance reaches to toxic levels, especially in the brain. Because Tay-Sachs disease impairs the function of a lysosomal enzyme and involves the buildup of GM2 ganglioside, this condition is sometimes referred to as a lysosomal storage disorder or a GM2-gangliosidosis. HOW A BABY BORN WITH TAY-SACHS DISEASE? TSD is an inherited disease, so when both parents carry a Tay-Sachs gene, each parent transmits the defective gene to their child. 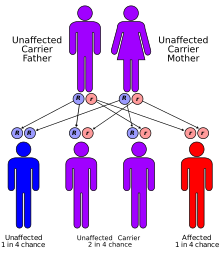 A child who inherits two Tay-Sachs genes (one from each parent) produces no functional Hex-A enzyme and will get Tay-Sachs disease. National Tay-Sachs & Allied Disease, association of Delaware Valley stated that when both parents are Tay-Sachs carriers, the probablity that their child will have the disease is 25% chance and there is 50% chance of having a child who will be a carrier. On the other hand, when only one parent is a carrier, there is no chance the child will have the disease. In addition the association of Delware Valley said that there is a 50% chance of having a child who will be a Tay-Sachs carrier. The most severe form of Tay-Sachs disease begins to affect babies when they are only a few months old. Initially, their development is delayed. They begin to lose their vision and react abnormally. Gradually they become paralyzed. The symptoms of the disease are loss of hearing, seizures, inability to swallow food, and difficulties in breathing. Since there is yet unaffective treatment for this disease, the researchers are trying some potential therapies.